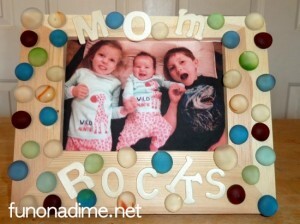 Another fun project from Debra! This next project is one I am so happy I’ve finally finished. I bought this frame about 4 years ago at a yard sale. It is kind of big, measuring about 28″ by 32″(I don’t really know. I’m too lazy to measure it so I’m just guessing). It has bounced around my home, lurking behind doors, loitering in the bottom of closets and stubbing people’s toes from under the bed, all while looking for a permanent place of residence. I didn’t know if I wanted to use it as a frame for an actual picture, or if I wanted to line it with metal and use it as a magnetic message board. I thought about putting cork in it with some hooks and hanging my grandmother’s jewelry on it. But none of my ideas seemed just right. 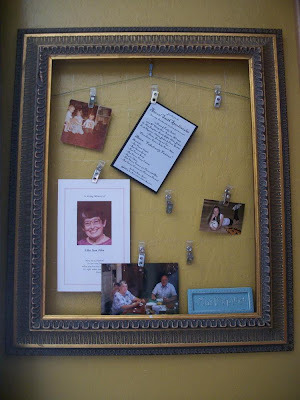 Then as I was perusing a “Stampin‘ Up” catalogue, er…I mean….I was coming up with ideas all on my own, I decided to put some wire in the back and hang some tag clips on it and use it as a place to hang pictures and invitations. I love how it turned out. I just wish my picture-taking skills were a little better. If I ever make another one there are a few things I’d do differently: like use a thicker gauge wire and thumbtacks on the back instead of teeny weeny finishing nails. I might even use chicken wire instead of weaving my own pattern with a roll of wire (not super fun by-the-way). That’s a pretty neat idea! Its simple but beautiful and would be a great addition to our living room. Thanks!